Blake Freeman, right, and Howard principal Leandrea Ware walk across the Life Force helipad during a tour at Erlanger Hospital on Wednesday, June 13, 2018, in Chattanooga, Tenn. Teachers from Howard and other schools which will launch Future Ready Institutes in the fall spent the week participating in externships at business partners across the region. This summer, Hamilton County educators, community leaders and business partners are launching a massive effort to prepare the next generation of workers. The brainchild of Superintendent Bryan Johnson, who began championing the idea soon after he took the helm of the district last year, Hamilton County Schools is establishing more than 20 Future Ready Institutes embedded in traditional high schools across the district. The fall initiative is a partnership between Hamilton County Schools, Chattanooga 2.0 and a variety of business partners. Many of the institutes, which each have a core industry theme such as health sciences, engineering, industrial manufacturing and hospitality, have business sponsors. "The Institutes are creating an ecosystem of collaboration unlike anything before in the community. This partnership between K-12, post-secondary, and business is a tangible example of what 2.0 has been working toward since the first conversation around workforce development in 2015," Jared Bigham, executive director of Chattanooga 2.0, says in a statement. Erlanger Health System, Unum, JP Morgan Chase and EPB were among the initial business partners alongside the University of Tennessee at Chattanooga and Chattanooga State Community College, which have been instrumental in the institutes' launch. This summer, business partners and school leaders have been preparing for the actual launch of the institutes through a Future Ready Summer Institute hosted at Unum in June, and on-site job training and externships for teachers at business host sites. 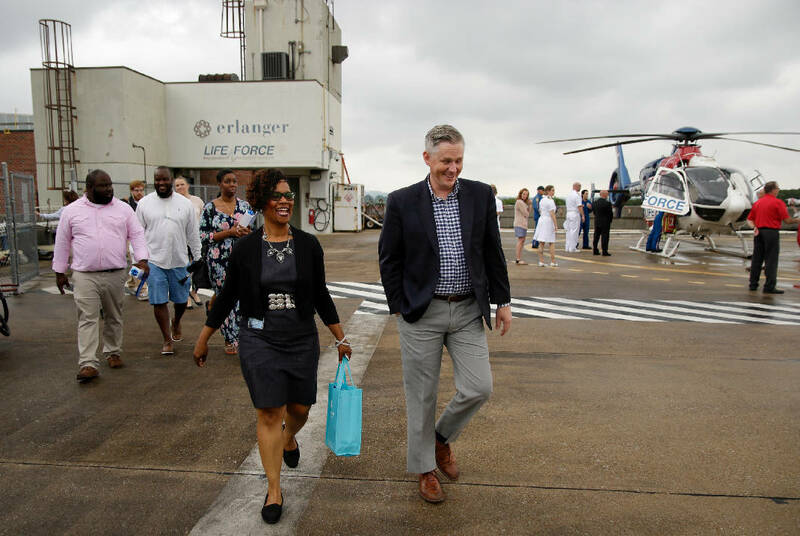 "This is a great initiative for us at Erlanger," says Don Mueller, chief executive officer for Erlanger's Children's Hospital, when a team of educators from The Howard School toured the health system's downtown campus in June. "I'm excited that we will have a new employment pipeline coming from Howard." The Howard School will house the only officially-branded institute, the Erlanger Institute for Health Care and Innovation, and leaders from both institutions are seeking ways to provide a mutually beneficial experience. Students at the institutes will attend classes in a cohort-fashion, with their traditional high school courses — such as English, math, science and social studies — coupled with career and technical education classes and a specially-tailored curriculum. The goal is for them to be exposed to real-world challenges and problems. Business partners' roles are to offer not only funding, but time — time for job shadowing and mentoring programs, possible internships and even jobs after high school. Students will be exposed to a variety of pathways including the ability to earn industry certifications, take dual enrollment courses and prepare for higher education, according to educators. "I'm excited that the investment of time and resources by these businesses is not just benevolent support because they are creating a direct talent pipeline in their sector," Bigham adds. Workforce development has been a key issue in Hamilton County since Chattanooga 2.0 launched in 2015. The district has worked for years to expand post-secondary options for students as it heard local business leaders' concerns that they were not able to recruit a skilled workforce from the local population. In 2015, a Chattanooga 2.0 report found that about 15,000 jobs in the country were not being filled by Hamilton County residents based on education requirements alone — almost 65 percent of graduates of the Hamilton County Schools system failed to earn any education past high school, leaving them unqualified for those jobs, data showed. These institutes are intended to tackle that. "Future Ready Institutes will tackle real-world problems in the classroom to ignite the passion of learning for students," says Superintendent Johnson. "The partnerships between the institutes in our schools and area business and industry leaders will combine the expertise of working professionals with the instructional skill of excellent teachers to prepare our graduates to be future-ready and poised for success after graduation." In June, staff from each Future Ready Institute also gathered at Unum for two days of meetings and training. Michael Weiss, Unum's innovation champion, issued a design challenge to teachers, and teachers learned strategies to incorporate real world-inspired projects into the curriculum. Unum is one of the district's partners in the initiative, donating the space and time for the team to host the Future Ready Summer Institutes. Educators visited other externship sites for two days, including Erlanger, TVA, Unum, the Public Education Foundation, the Chattanooga Metropolitan Airport and Komatsu.